In today’s blog I want to talk about how you can make the biggest impact with your auto-responder so you can deliver great content to your email list. These steps will help you to build trust quickly which helps you promote your product or service which helps you get ahead faster while giving great value and being seen as a leader in your niche. Time and time again I see experts telling people to organise their email list by multiple lists. You organise your list members by interests, by sales, by failed sales. Over time, you end up with multiple lists. Each list having its own auto-responder series. So far all looks good and with each list having its own auto-responder series. Do you have your list members in one list or duplicated in more than one list as they may fit multiple lists? The issue with having people in multiple lists is. One list could send the person an email serious then another list sends the list member an email from a different series where the user is trying to follow one series and ends up getting confused as the mix-and-match of emails confuses both email sequences. The result is your list member stops opening your emails or unsubscribes. At this point you have lost them. A better solution is to have your auto-responder tracking code on your site and set up automation for tagging as emails are sent, or a blog on your website gets opened from an email link. This way you build a profile of each user and what they look at on your site which had them most interested. As every page on your funnel your visitor looks at from your email link gets tagged to the email address by your Auto-Responder. Meaning you can have an automation setup that emails based on users who have tag 1, tag 6 tag 9 and tag 11. Then email an invitation to your sales letter or video. when you start off with a new list or campaign, the excitement is blazing you want to get stuck right in which is great. The problem shows itself after you set up your list you then need to set up your email funnel to drive people on to your sales page. It’s at this point too many people get caught up with tracking. They look at different tracking models e.g. UTM tracking third party tracking email auto-responder tracking migrating your auto-responder with your website for tracking. While all these tracking solutions have their own benefits. People end up procrastinating rather than write their email flow, causing new email list members to see a couple of emails then nothing. A better approach would be to write 5 or 6 emails at one time and have those 5 or 6 emails set up as one email a week making sure your first subscriber does not catch up with the latest weeks email then write another 5 or 6 emails and put them in two weeks. Keep repeating this email writing process and you will stay ahead of the game and visit tracking when you have that window where the first subscriber has not caught up to the last email. The key thing to remember here is. You can always change tracking if it’s not what you expected as many people get confused with the original tracking they setup. However, unfortunately many people do not take the time to become experts at tracking which is a must, to keep costs down and conversions up. I understand it’s a must to personalised emails for higher conversion rates and sales down the line. The issue comes with cost versus quality let me explain. When your landing page only asks for the visitors email address more people subscribe and if you’re driving people to your landing page from paid advertising you want to squeeze every subscriber out your advertising budget. On the flip side if you ask for the person’s first name and email address you get less email subscribers but you can personalise your emails right from the get go. Does this really matter, for me the verdict is still out and different niche’s have different interests so test what works best for you. That being said. What I do is… I tag my email list when I send out an email and my emails have cliffhangers to show my email list readers who click on my email to go to a blog which I track with my email system which is Active Campaign and has tracking code on the back of my webpage which takes the email address and adds the tag of the blog the person visited to the email visitor. You can see the below visitor download my Opt-In Download PDF as the System tagged them automatically then added them to my Intro Set email auto-responder. I do this process from one list and group each user into my categories based on tags. Using tags are super simple yet very effective at giving your reader focused content on auto-pilot. This lets me see what content each of my list members consumed and I know that a group of tags together means a list member has checked several blogs on a topic and for those who check several blogs on a topic I can set up an automation in my active campaign that says something like if an email user has this type this type in this tag sent this email or if an email user has this time this time and this time send a different email. By doing this, you end up with multiple interests being addressed I’m really focusing personally on your readers interests which improves conversion rates build trust and sales. I was looking at a website using Google Analytics that has over a 1.1 million visits a month. What’s interesting is that the amount of people who signed up to that site was nearly a 48/48 split between mobile and desktop with tablets at a negligible 4%. Based on mobile conversions being so high I would ultimately advise when writing emails to keep them clean. Too often I see emails being sent that resemble flyers which have a terrible conversion rate as half the content does not load on a mobile. Your list want speed and good performance, people do not have time to download images and just skip to the next email to get through all the emails normally when commuting or on lunch or in the canteen while on a break, etc. We all know subject lines matter and we spend so much time trying to perfect the perfect headline. So I thought of a better solution. Type your headline into Google or YouTube and let Google and its AI algorithms sort through millions of pages to bring back the top 10 Google listings with headlines showing you the top 10 results based on user interest and high click through rate which is ultimately the result you are trying to achieve. Now, it couldn’t be simpler. My advice here would be – why reinvent the wheel when Google can do it all for you and is number one in the industry for finding the best content for you and everyone else. So use the power of Google and speed up writing email subject lines. When is the best time to send emails? This question gets asked over and over on forums read-it and a host of other websites. The main answer here is it all depends on your niche or niche depending where you’re from. By all means send out emails and do a multivariate test where you split your email list buy 20% 20% 20% 20% or 30% 30% 30% or 50/50 and send out different times to see what works best for you. For me, I choose not to do that. I prefer to check my auto-responder is set to the local time of each country of each subscriber on my list which I believe is on for most email services by default. Best to check for yourself. When the user subscribes to my list. My list re-sends any emails in my automation on that time. The reason being is that it’s a safe bet when the person joined your email list, that will be the same time they are normally on their phone checking emails which to me is a good time to send my automated emails. The key thing to remember is that email Marketing is all about consistency to build trust which ultimately leads to a sale of a product or service by sending emails on the time the user subscribed and keep doing it gives you the best chance of getting that email seen also quality of email content plays a massive part and using cliffhangers at the bottom of your emails keeps your list interested on what’s coming next or the next call to action of the email onto a blog. 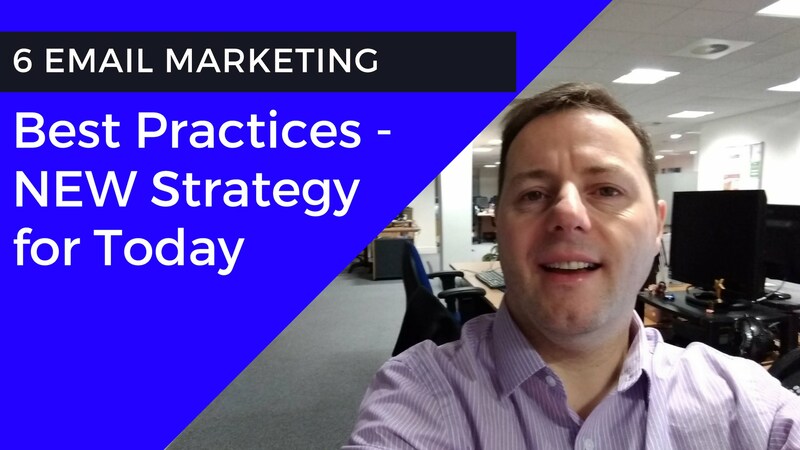 This is my 6 email Marketing best practices and if you follow them, please leave a comment to let me know how you get on. Click on the link below and join, have a chat or ask questions, even share success stories you may have had yourself.